Our adventures through this crazy life. This is a great idea for a weeknight dinner or for easy entertaining! All you have to do is throw all the ingredients in a baking sheet and, you guessed it, bake it. After a little while you have a “one pot” (in this case sheet) meal! The bestest (is that a word?) part is that it is great hot or room temperature. Therefore it allows you to spend time with your guests instead of spending time with your pots and pans (God knows we already spend way too much time with them). Set oven to 400 degrees. Cut corn into 2 in. pieces. Rinse potatoes. Toss potatoes and corn with 1 Tbsp olive oil and salt and pepper to taste. Place in a baking sheet and bake for 15 minutes. Potatoes and corn take a little longer to cook so they need a head start! Meanwhile season the shrimp with the remaining 2 Tbsps of olive oil, salt, pepper, garlic, and old bay. Set aside to marinade for at least 15 minutes. Slice your lemon into pretty, thin rounds. Cut your green onions into 2 in. pieces, use white part also (I never understood while people don’t use the white part! It has a lot of flavor, looks pretty, it isn’t particularly hard or anything like that. So why? This question plagues me! But I digress. Rant over!). Wipe your mushrooms with a damp paper towel (don’t rinse because they absorb water, and we don’t want soggy mushrooms). Now hopefully 15 minutes have passed and we are ready to assemble! Take potatoes and corn out of the oven. Let it cool slightly, I don’t want you burning yourself! 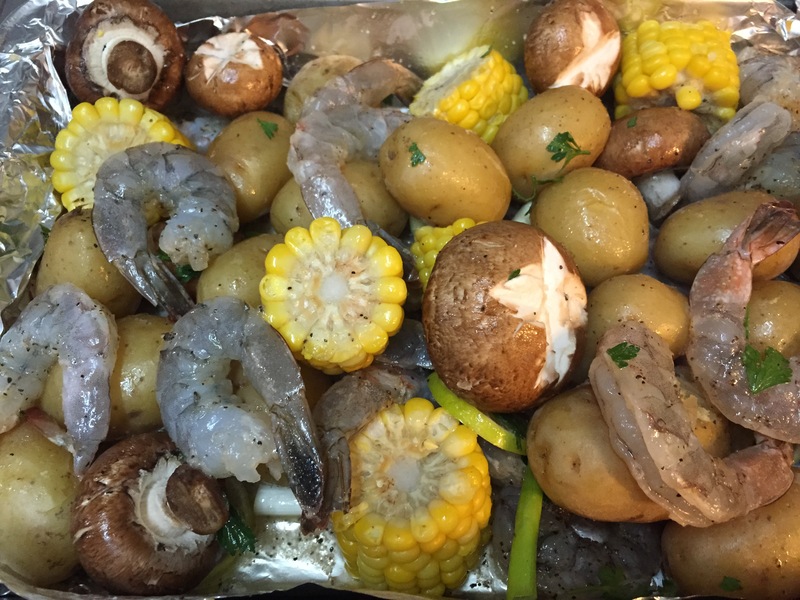 Toss seasoned shrimp, mushrooms, green onions, and lemon slices with the potatoes. Make sure you really get in there and mix everything up! (If it is too hot use a spoon instead of your hands). This will get all that yummy garlicky seasoning into all the components. Serve with a nice crusty bread or garlic bread! This is my recipe book. A collection of the meals I make for my loved ones. I like. Se ve deliciso. Lo vamos a hacer. Next PostKorean Inspired Pancakes, The Breakfast Of Champions!